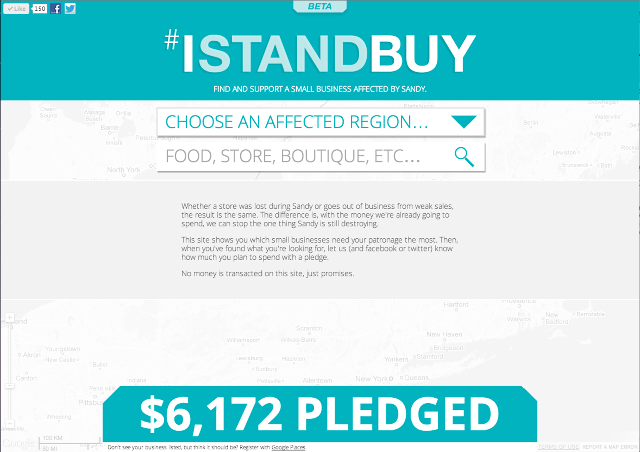 SUPPORT A SMALL BUSINESS YOU CARE ABOUT AFFECTED BY SANDY. This site is a personal project that helps small business patrons and owners get the word out so shoppers know where to spend their money to most effectively save their neighborhoods. Whether a store was lost during a storm or goes out of business from weak sales after, the result is the same. We can't stop the former but we can the latter. Utilizing money consumers were already going to spend, we can stop storm rattled stores from closing long after the clouds have parted. No money is exchanged on the site, just promises to spend through pledges that are tracked and shared through facebook and twitter.